Saint Francis of Assisi was the son of a wealthy cloth merchant, who lived in the Italian city of Assisi. Francis was born near the close o. As a young man, he gave himself up to the full enjoyment of life in this world, and he dreamed of of becoming a knight and winning worldly honors. To fulfill that dream, he joined a military expedition organized by the leaders of Assisi, to take on their ancient rivals, the city of Perugia. The two armies met in battle, and the Perugians defeated the soldiers of Assisi, taking many captives, including Francis. Imprisoned in a dark dungeon, with other noble captives, he kept their spirits up by singing the songs of troubadours. Still, it took some time for his father to arrange a ransom; by the time of his release, Francis was broken in body and spirit. During his slow recovery, he began to wander through the fields and forests of the Umbrian countryside. He was drawn to caves, and small chapels; where he prayed to God, opened his heart to Him. God the Father sent the Holy Spirit to him, and inspired Francis to turn to the Gospel of Jesus Christ for direction. Intent on following the ways of the Crucified Savior, he stripped himself of all his riches, put on the robe of a beggar, and traveled the Italian countryside, as a Herald of the Great King! He cared for the lepers on the outskirts of cities and towns; and preached about God’s love in the marketplaces and public squares. Soon other men came to join him, and in 1209, with Papal approval, they became the Order of Friars Minor. A short time later, the Holy Spirit inspired one Lady Clare of Assisi to seek out Francis for spiritual direction. Desiring to also live the Gospel life, she and Francis founded the community of the Poor Ladies of Assisi, who would eventually be known as the Poor Clares. Many lay people also came to Francis, and his brother friars for spiritual direction. They too desired to follow Christ, but could not, in good conscience, leave their families. They became the Brothers and Sisters of Penance, and received from Francis a letter of spiritual guidance. This group would eventually become the Third Order of St. Francis, known today as the Secular Franciscan Order, or the Order of Franciscan Seculars. Francis would continue to live a life of prayer, of service to the poor, and of preaching. Pope Pius XI would say of Francis: “So lifelike and strikingly did the image of Jesus Christ and Gospel manner of life shine forth in Francis, that he appeared to his contempories almost as though he were the Risen Christ.” On September 14, 1224, while on Mount Alvernia, alone in deep prayer and contemplation; Francis had a vision, which resulted in him receiving the stigmata, the wounds of the Crucified Christ. He had never been in good health, and in the fall of 1226, he was dying. 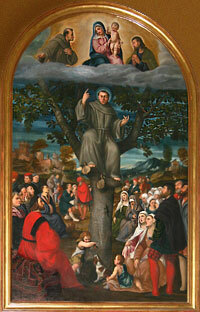 He had his brother friars carry him back to his beloved Assisi, where he died on October 3rd, 1226. He was canonized a saint in the Catholic Church, on July 16, 1228. His remains are entombed in the Basilica of San Francesco d’Assisi.